The powerhouse vocals and charismatic stage presence of lead singer KathySings4u combined with the supreme musicianship of lead guitarist extraordinaire Dave Toro, funkmaster bassist Nelson Cimo (of The Strut Band), and precision drummer Tom Ward bring a variety of dance music spanning over the past 60 years. Your venue clientele, wedding guests, donors at a fundraiser, and corporate event attendees will be moved and stay groovin' all night long! And just like their memory of that first puppy love, they'll find the evocative music of the First Crush Band never fades . 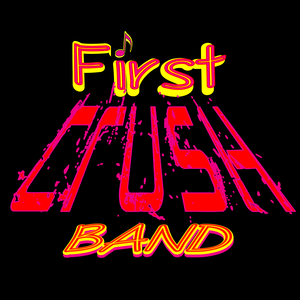 . .
First Crush Band uses state-of-the-art electronic drums and digital sound which makes the volume perfect for any size venue - indoors or outdoors!